All of these things seem to weigh heavy on us as we continue our journey with the Lord during this season of Lent. We keep all these things in mind as we struggle to be faithful disciples. As I write this I am mindful of the full-time ministers of our diocese who have committed themselves to advancing the gospel message and mission of the church. They are faithful in serving the Catholic faithful in our parishes and missions. These men and women have taken upon themselves many of the challenges of ministry. 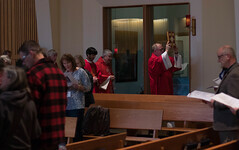 On Wednesday, February 29, 2012 we had the first teleconference meeting of all ministers in the Diocese of Juneau. It was a historic moment for the Church in Southeast Alaska. Represented in this teleconference were the priests, deacons, religious and the lay people who strive to bring Christ’s presence to the world. This past week (March 6-9, 2012) all the bishops and priests of Alaska met in Anchorage for our third annual multi-day priest convocation. In speaking to some of the priests scattered around this great state, I learned that many share in different kinds of hardships related to ministering in missionary land. For example, Father Stan, a priest of the Diocese of Fairbanks, had to travel 16 miles by snowmachine through a blizzard before boarding a bush plane that then took him to Fairbanks. There he boarded an Alaska Airlines flight that ultimately brought him to Anchorage for our meeting. 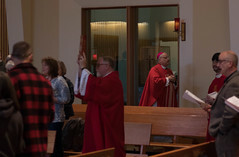 This multi-day priest convocation afforded the priests of the three dioceses of Alaska an opportunity to hear from experts in psychology and priestly ministry on the topic of the Internet – its blessings and its curses. In addition to hearing from our guest speakers, we addressed various concerns that come with exercising ministry throughout our country and within the state of Alaska. Our conversation included addressing the HHS mandate, school choice, the year of faith (commemorating the 50th anniversary of the Vatican II Council), priestly life and ministry, and how to better serve the people of God entrusted to our care. While together in Anchorage, the priests of the Diocese of Juneau met separately to address the concerns of the Church in Southeast Alaska. We discussed the need for more priestly vocations in our Diocese, fundraising efforts (such as the Alaskan cruise, the Faith In Action annual diocesan appeal, etc. ), and various parish programs. I am mindful of the difficult sayings of Jesus as I continue to minister in the Diocese of Juneau. I am writing this column to you from Yakutat. This evening (Saturday, March 10, 1012) I will celebrate the Sacrament of Confirmation for three fine young people here at St. Ann’s Church. It’s important for them, and for all those preparing for the Sacraments, to know that following Jesus and being his disciple is not easy. Yet, I am pleased to know that the young people will step forward for confirmation asking for the strength and grace of the gifts of the Holy Spirit to fortify them as disciples. As they present themselves for confirmation, I know that they do not come alone – for they have a sponsor and family members behind them as well as the parish family to support them. In reality, we cannot embrace discipleship alone. We need to trust in Christ’s promise – “I am with you always.” (Matthew 28:20) Picking up the cross with Christ is the first step in being loyal disciples. As we approach Holy Week we enter into the Paschal mystery knowing that in dying with Christ we will also rise with him. Blessings to you throughout these days of Lent and through the celebration of the Sacraments, especially the Sacraments of Penance and the Eucharist, may we once again commit ourselves to following Christ.